Oh hey, it's me! And I was finally able to take blog photos this weekend, which makes me a bit happy! I picked up this top and these pants a couple of weeks ago during one of Express' 40% off sales and I've been wanting to wear them together ever since (even though I didn't necessarily buy them to wear together.) 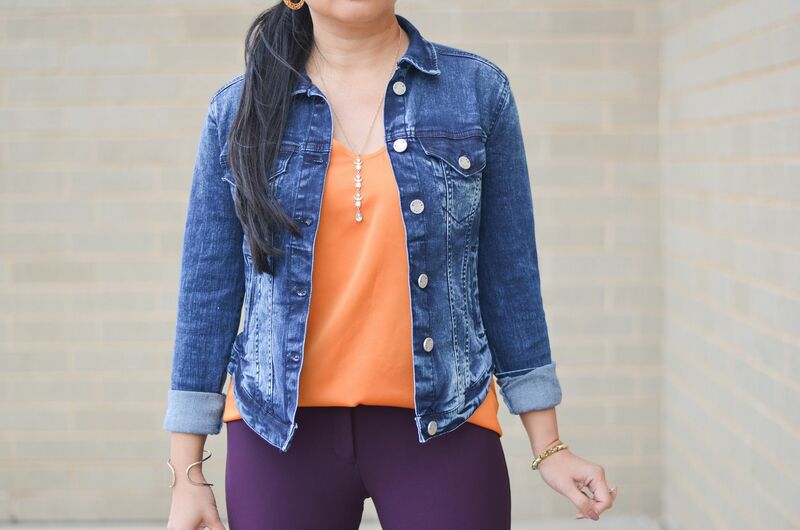 The colors scream fall and even though the weather won't make up it's mind, I am certainly ready for all things fall including switching my wardrobe from hot to cool weather once and for all! I used to have a HUGE collection of Express' Editor style pant. But, since I can wear what I want to the office, I stopped buying dress pants some time ago and admittedly, I don't have many pants that aren't jeans, leggings, or jeggings. But, I know there is a need to have them in your wardrobe, and frankly, these fit really well that it would be a waste to only save for them for business casual office wear! The thing I struggle with wearing skinny pants that aren't fitted all the way to the ankle is that the pant legs tend to ride up and get "stuck" on my calves, making the pants look really bunchy at the knees. (See the last photo in this post for what I mean.) I was worried these pants would fit the same way, but the pant legs have just enough give so the material skims my calves and I'm not constantly having to pull down on my pant legs. I love them. I'm wearing a 4 short for reference NOT petite. How gorgeous is the color of this top? I love it. It's not quite bright orange, but it's not quite yellow/mustard either. Marigold. Marigold is a good color to describe this top. The fit is very similar to the Barcelona cami, but I prefer the shape of this a little better because the back has more coverage vs. a racerback shape. And even though the difference in the neckline is so subtle, the "soft" v-neck seems less fussy. I always have to do a bra check in a Barcelona to make sure it's not showing, but this keeps me covered nicely. I'm wearing a small. As far as life - it's much of the same, one part crazy and two parts exhausting! It was nice to be able to take some photos for the blog this weekend though just to take a break from the chaos! I'm off to Louisville for a quick day trip today and then I'm in Chicago Wednesday and Thursday!! I have to find some time to fit in Pilates somewhere in between because I am officially one month from my final practical and final performance so I need to be in top shape! Needless to say, no rest for the weary! Hope you all had a great weekend! I only have one pair of dress pants in my wardrobe too, it's a definite gap. I haev so many jeans though, ha! Such a great color combination! I absolutely love it paired with the leopard heels! Love the color of these pants and I adore the color blocking too. So chic! Thanks for the link up. The colors of this outfit are so beautiful and just perfect! I'm glad you liked the cami! I honestly think I like it better than the Barcelona, too. The slightly-more-coverage makes it a little easier to work with and appropriate for more settings. I'm so excited for you to finish up your pilates training! Okay, I had to laugh at your description when they get bunchy because the pair I wore yesterday did that to me!! But you have the funnest pants--I need a pair in this color! 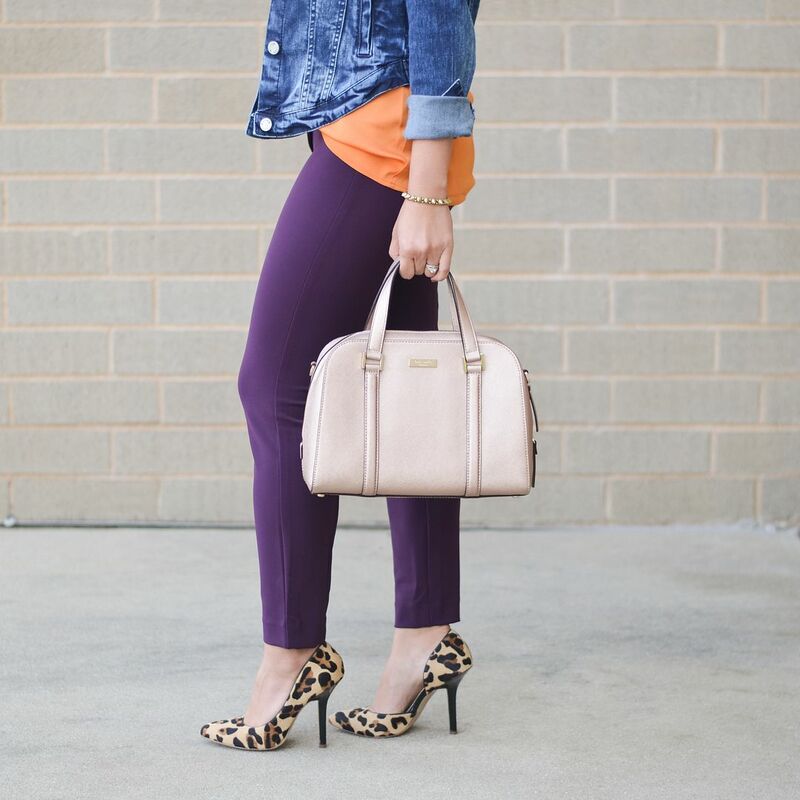 Love the so completely unexpected pairing of purple with bright orange, and then the denim and leopard print heels. LOVE. What a lovely outfit! Love how you styled it. You rocked it! Thanks for sharing and hosting the link up as well! I love the color of these pants! They look so good styled with the orange and denim jacket. You're making me want to add more color to my wardrobe! Love those purple pants! I'm not much of a purple person but they are such a pretty shade. I love the combination of colors in this outfit...so perfect for Fall! I love these colours together and the leopard print heels are fab! Such a pretty look! Those leopard print heels are fabulous and really add the perfect finishing touch to your outfit! Love the color of those pants! Perfect for fall!